Do the Rogue Pits of cemeteries still exist? In the not-so-good old days, there used to be an annexe to the Christian cemetery, called Rogue Pit in some places, where members who had commited suicide or had lived sinful public life would be burried. These days, such annexe is hard to come by. I wish to know whether the Catholic Church has officially stopped segregating a part of the cemetery to be used as Rogue Pit, or has the practice tapered off without invervention of of the Church authorities . The rogue pits that once existed were outside consecrated land and not part of a Catholic cemetery. Rouge Pits are not the same thing as receiving vaults which are still somewhat common in cemeteries that have harsh cold winters. Less common in modern cemetaries, they can still be found here and there. This whole question of rouge pits reminds me of the story of Pope St. Gregory the Great and how he refused to bury a monk because he broke the rule in regards to poverty. Rogue pits is a fancy name for designating the place of burial for those who could not be buried in consecrated ground. In later Anglo-Saxon England, executed offenders and, probably also, other social deviants were separated from the rest of the community in death. They were buried in cemeteries far from settlements but in raised landscapes which would have been visible from frequented areas – so-called ‘execution cemeteries’. However, from the second half of the eleventh century, these deviant cemeteries appear to have fallen out of use. Rouge pits and execution cemeteries are simply terms that a cemetery that had not been consecrated for Christian burial. The dunghill of St. Gregory is an example of this also. Sinners were at one time not permitted to be buried in consecrated ground. There is no need for such cemeteries now, as civil cemeteries are not consecrated by the Church. Individual plots are blessed in such cemeteries in modern times. 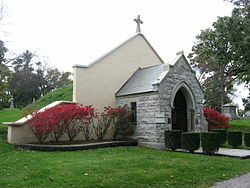 Those who "commited suicide or had lived sinful public life" and died impenitent cannot be buried in Catholic cemeteries. I've never heard of the term "rogue pits," but if they exist, they couldn't be on Catholic cemetery grounds. Does the incorrupted body of St.Cecilia still exist?